Hey, Chicagoans–the opening of the Architecture Biennial this weekend includes your humble narrator in a roundtable discussion at Crown Hall on Saturday, 3 October from 5:00-6:00pm The topic, whether or not Chicago is still the “Silicon Valley” of high rise construction (spoiler alert: yes) deserves a bit of historical context, which I’ll be happy to provide. 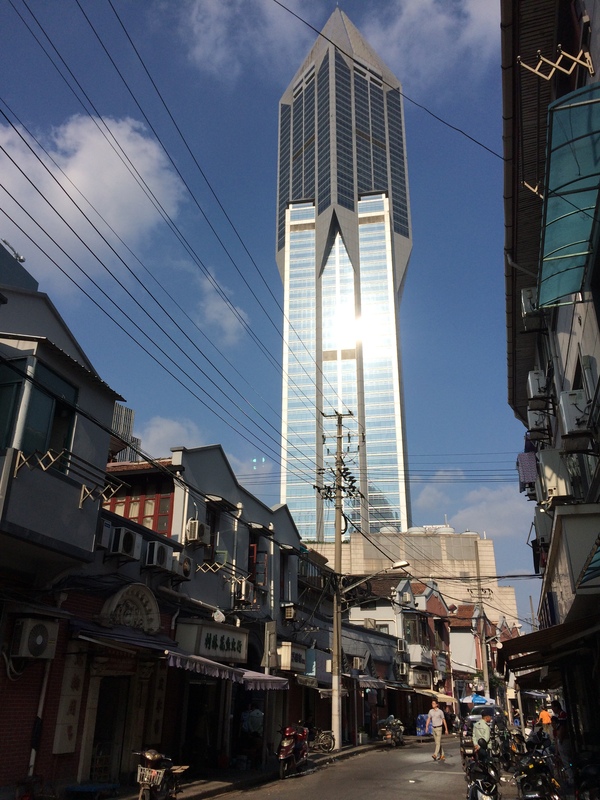 The corner of Huayuanshiqiao and Dongtai Roads in Pudong is skyscraper nerd heaven—three 400 meter towers on three corners, including one former CTBUH record holder (that held said records for less than two years—not quite 40 Wall Street territory, but a pretty brief reign, nonetheless). 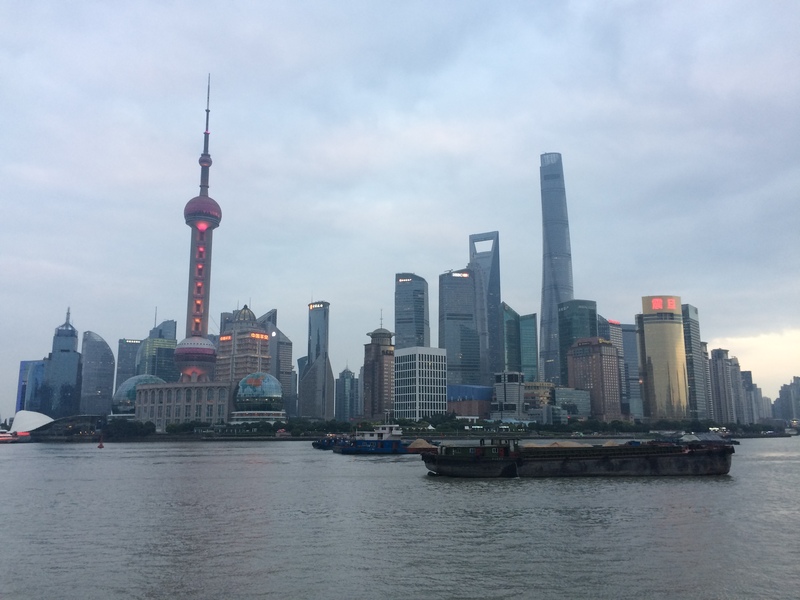 Pudong has been a hub of tall building activity since 1993 when the Chinese government set up a special trade zone on what had been shipyards and worker’s housing just across the river from Shanghai’s Bund. A masterplan by Richard Rogers that would have created a vast, circular park with mixed-use (and income) housing around it was quickly hijacked in favor of a more lasses-faire approach that consciously tried to build up the Lujiazui Road district into a new Lower Manhattan. 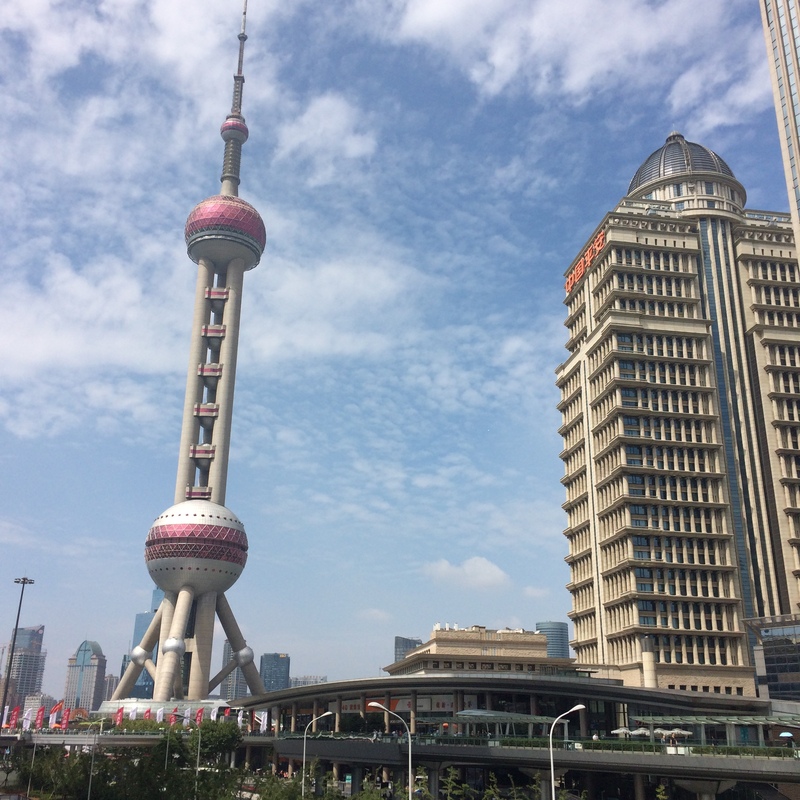 The first tower to be built was the disarmingly literal Pearl TV Tower, a 468-meter tall tourist destination finished in 1995 that irrevocably marked the new location on the city’s skyline and—for better or worse—set the bar in terms of architectural quality for much of what was to come. 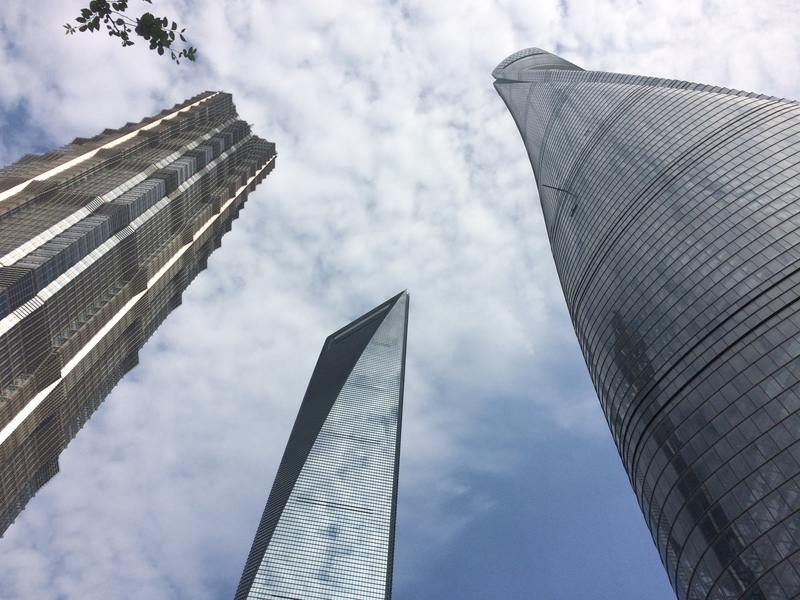 OK, but what you cross the river for, really, is the three supertalls—SOM’s Jin Mao (1999, 420m), KPF’s Shanghai World Financial Center (2008, 494m), and Gensler’s amazingly graceful Shanghai Tower (now-ish, 632m). 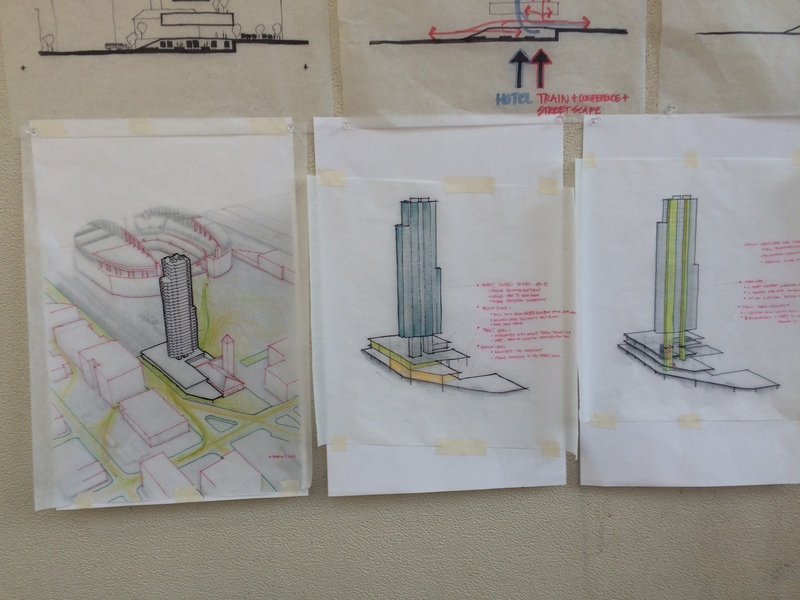 The three of them—nicely spaced both height-wise and chronologically—also show three approaches to skyscraper form. Jin Mao is perched somewhere between Adrian Smith’s postmodernism of the 1980s (AT&T and NBC in Chicago being the paradigms) and the more rationalized forms of his supertall work with SOM and on his own (Trump in Chicago, Burj Khaliffa, e.g.). The pagoda form disguises the fact that it’s really two towers—a central core office building for the first 60 or so floors, and an atrium hotel for the remaining 28 (8 being the most auspicious figure in Chinese numerology, the tower is of course 88 stories tall). That requires an enormous set of transfer structures to accommodate an eccentrically placed elevator core over the symmetrical tower below—none of which gets celebrated or acknowledged. There’s a similar slickness—maybe more forgivable considering the sculptural proportions involved, in the World Financial Center. This is a pure form, tapering from a square base to a linear top, with the resulting ruling lines expressed as arcing edges. It’s an elegant way to get a mix of floor plate sizes into the tower—again offices below and hotel on top, this time without the atrium. And it made it easy to punch a hole through the thin top portion of the tower—harking back to the late 1980s when somehow every skyscraper had a top with a punch through it. Here, the punch-through makes for two dramatic observation decks—one at the bottom of the void and one at the top (with a few bits of glass in the floor that give a sense of just how high you really are—not quite as dramatic as Sears’ cantilevered glass boxes, but definitely attention-grabbing). All three of these make you look up, and when you do you get rewarded by three very resolved forms that follow a pretty evident rigor—formal, geometric, or aerodynamic. The three of them also play well together on the skyline, making a sort of instant classic much like Chicago’s big three (now four) that always seem to be having a long distance conversation as you’re coming into town on the Ike. But at the ground level? That’s a different story. 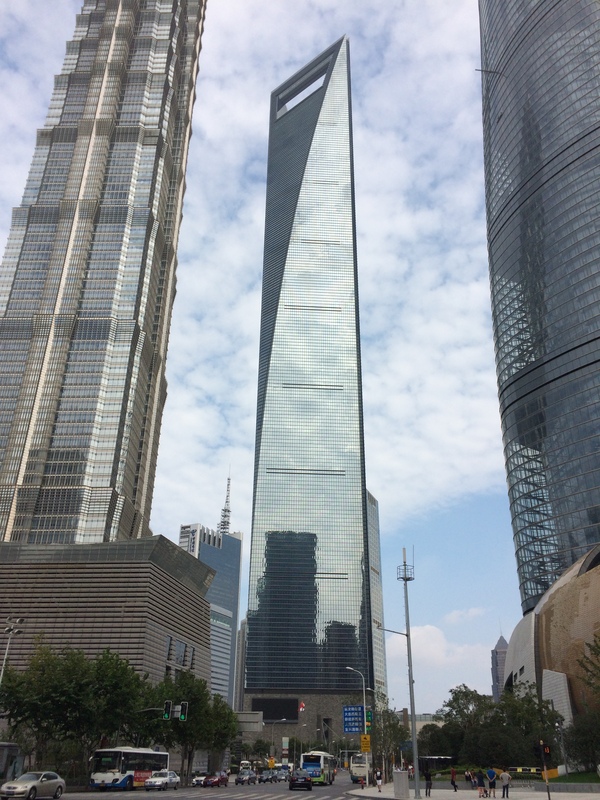 All three have a retail component that is either integrated into the tower base (World Financial Center), set adjacent to the tower itself (Jin Mao), or sort of smashed together (Shanghai Tower). 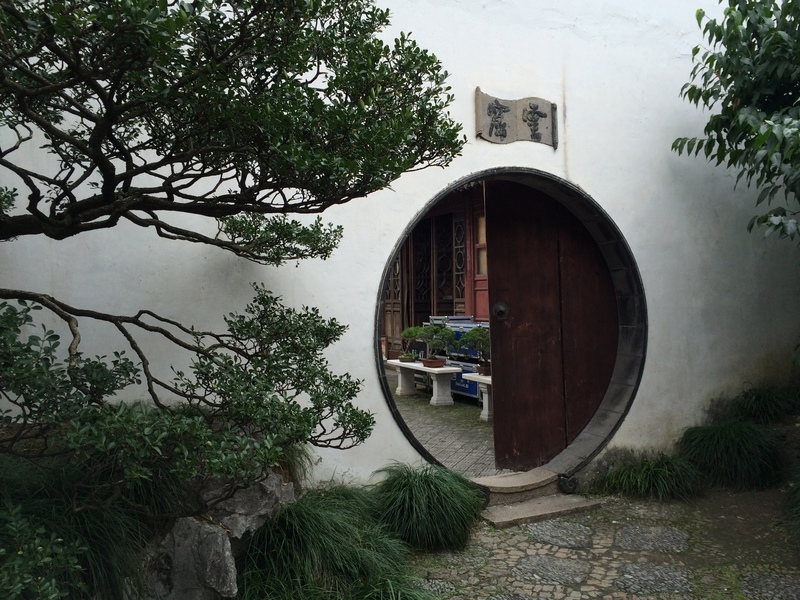 Just like some architects have trouble resolving a front door (Bucky Fuller, anyone? ), the real aesthetic and urban shortcomings of the supertalls seem to be the way they relate to the ground—and, worse, the street. Jin Mao in particular seems to slam into its site almost violently. 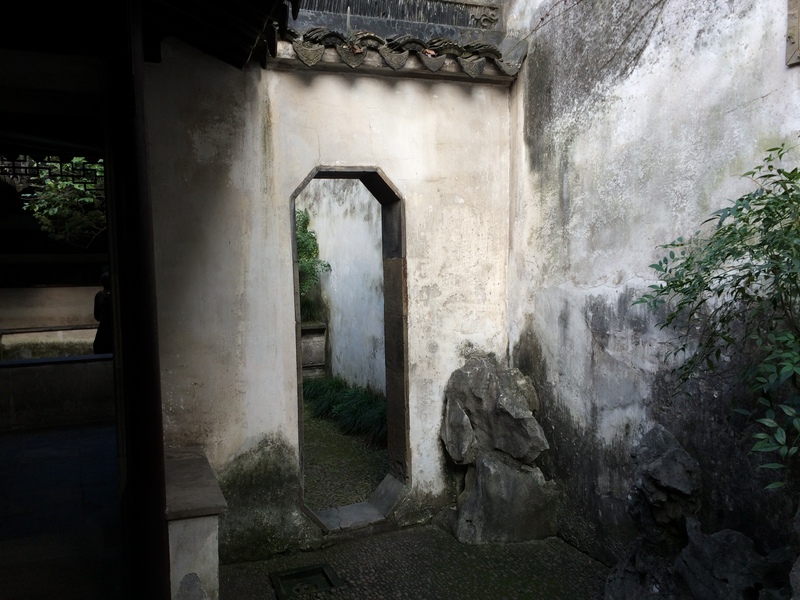 It opens up into three very obvious front doors (and what might be the world’s largest breezeway connecting the shopping mall). 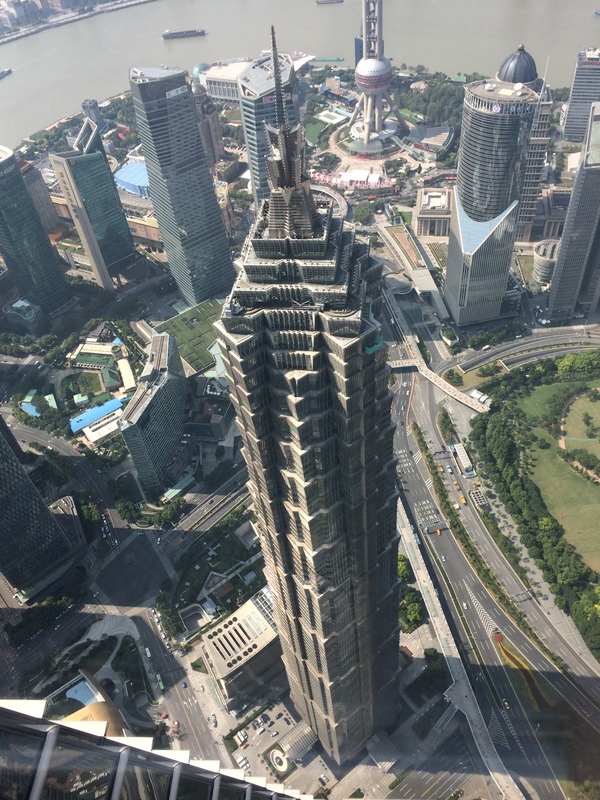 And Shanghai Tower’s base building really seems to have come from another team altogether—its curving forms are clearly nothing to do with aerodynamics, and it sort of cheapens the logic of the tower to see some of the same swoops deployed to no particular functional end. Part of the issue, of course, is the planning of the district itself. One thing that did make it through from the Rogers masterplan was the idea of superblocks—all of the streets are arterials, leaving very large parcels in between. Too large, really, to reasonably negotiate between some kind of street life and the scale of even the largest office floor plate. So what’s left is a sort of urban planning horror vacui, what looks like a need to fill space in some kind of meaningful way. This is the grownup equivalent, I think, of the studio site plan that comes together the night before the review, when all sorts of crazy planting patterns emerge from nothing more than a graphic logic. The superblocks in Rogers’ scheme, of course, were designed to be shot through with public circulation—pedestrian circulation. With the towers and retail malls (a combination that continues on virtually every block—how many Prada stores does one neighborhood really need?) there’s no meandering, and the pedestrian routes are slowly getting raised up onto skywalks to avoid the city’s notorious traffic—red lights here are generally read more as suggestions than anything else. 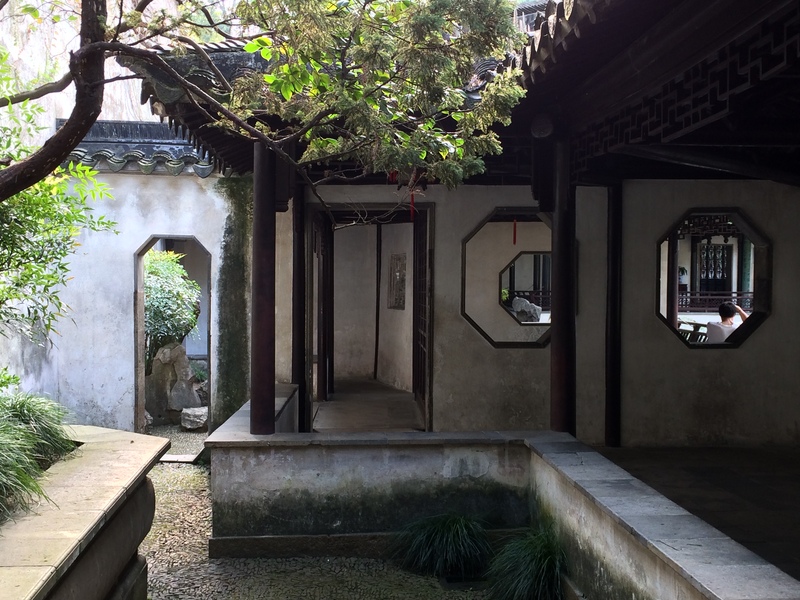 We celebrated a good round of meetings with a day in Suzhou, a city full of 16th and 17th century gardens a couple of hours west of Shanghai (meaning, really, the suburbs). 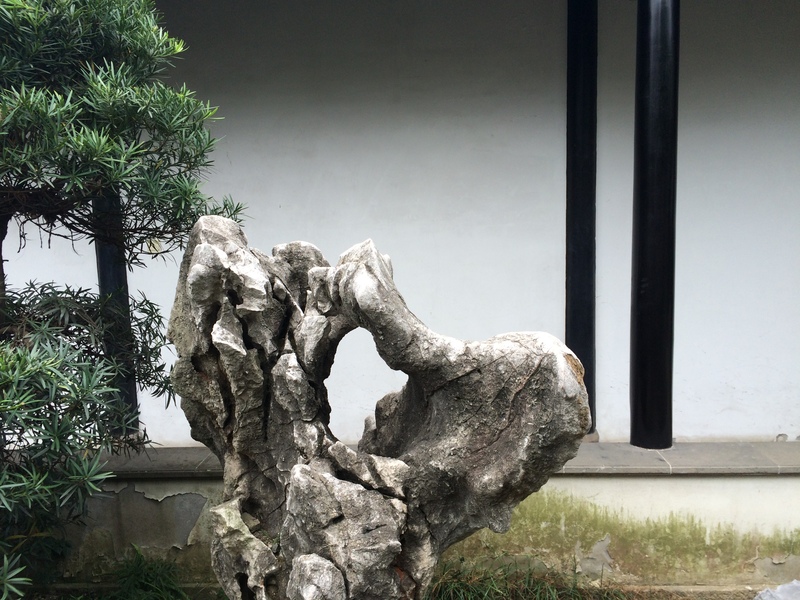 Suzhou was a favorite weekend destination when I was here in 1988, and it’s one of the places where I remember starting to realize that architecture was more than pretty drawings–that space could do something to you cognitively, spiritually, emotionally…The gardens here are all classical Chinese, and they all have in common a sense of composition and wandering that fills all of the senses with glimpses of what’s to come, layers of architectural and natural elements, and a very cleverly arrayed palette of materials under foot, gripped by the hand, and seen by the eye. And even if they’re much more than visual, they’re still a feast for the camera…last time I had my trusty Minolta and a brick of Tri-X black and white film, this time the iPhone was it. 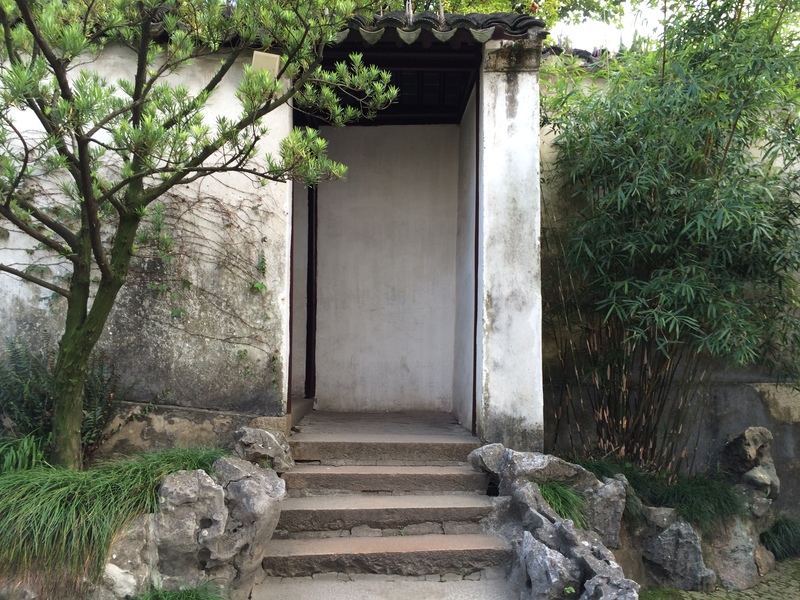 One of the main gardens was designed by Wen Zhenheng, a garden designer whose masterpiece was actually a 12-volume treatise called “On Superfluous Things.” An irresistible title, one that alludes to the fact that he was working for the extreme leisure class. Subjects covered? 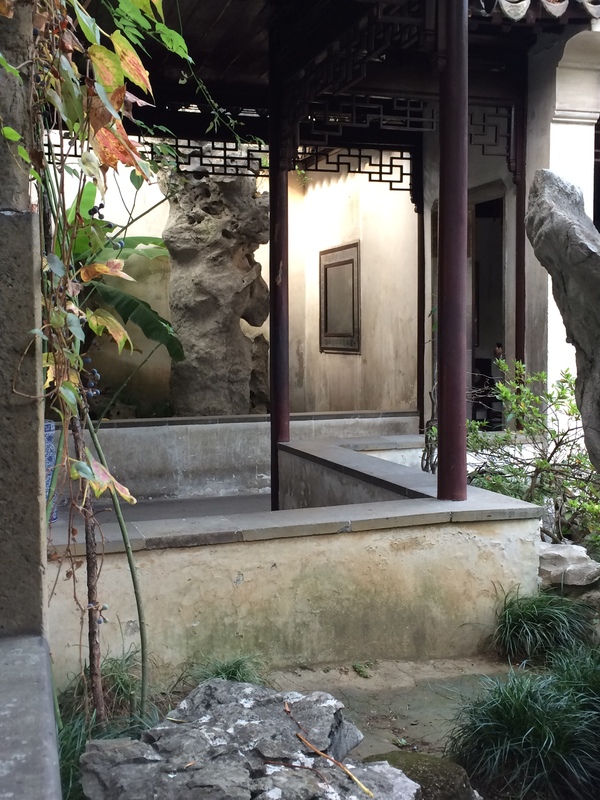 “Flowers and Trees,” and “Water and Stones,” pretty obvious fare for a garden designer. But also “Chairs and Beds,” “Utensils,” and “Vegetables and Fruits.” There’s a full English translation available, full report to follow eventually. 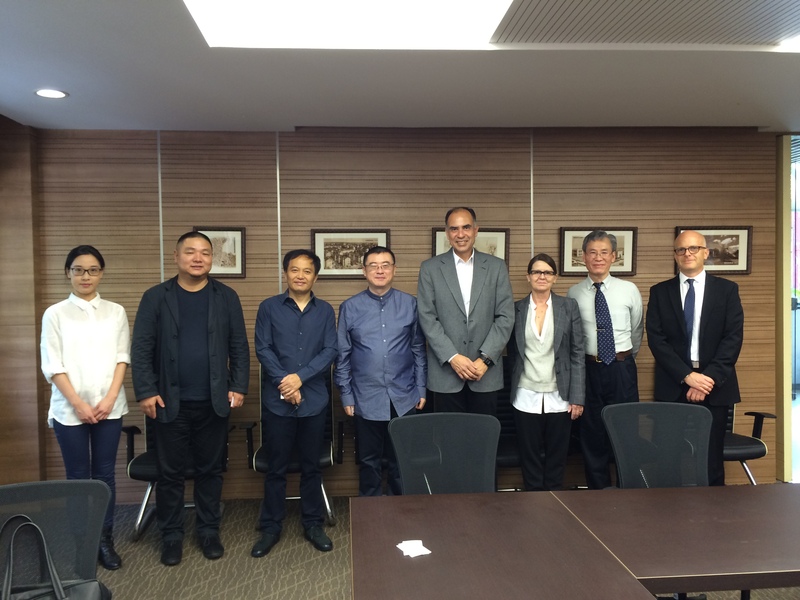 Shanghai, of course, isn’t the same city. There were virtually no cars when I was last here, no metro, and no sewage treatment plant. Today, the shipyards across the Huangpu have been replaced by some of the tallest skyscrapers on the planet, including the new Shanghai Tower by Gensler that features a gorgeous, twisting curtain wall that forms ventilating sky gardens up the height of the tower. 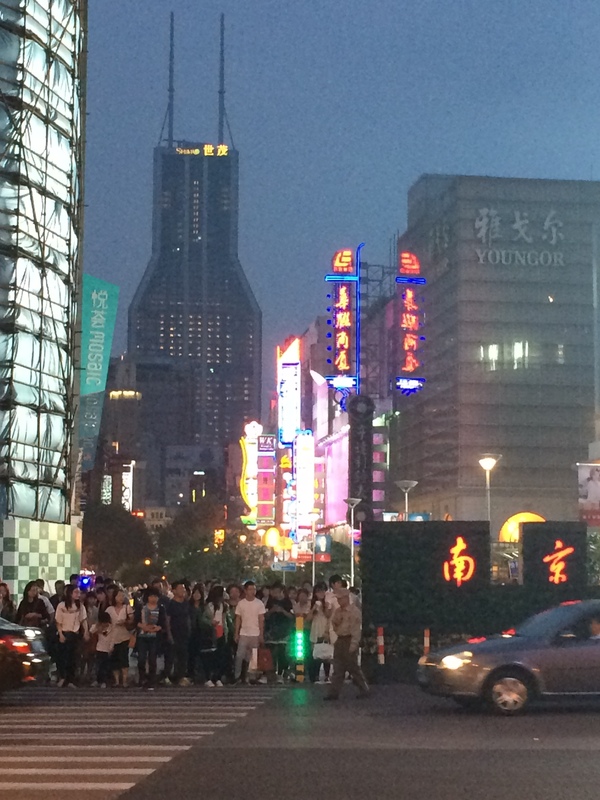 (The Pearl River TV tower, to the left, is less describable). Looking the other way, the view is actually not all that different. The Bund remains a mid-scale moment in the relentless construction in the city, and the Peace Hotel (with the pyramid) is still a hotel, even if the jazz band composed of ancient cadres who’d had to learn their riffs pre-1949 has been replaced by hipper fare. The Peace is now owned by the Fairmount, and the black market money changers who helped us get by that summer on about $150 total for eight weeks have been replaced by black market counterfeit watch hawkers, which pretty much encapsulates the way the city has gone upscale. More later on the skyscrapers here. 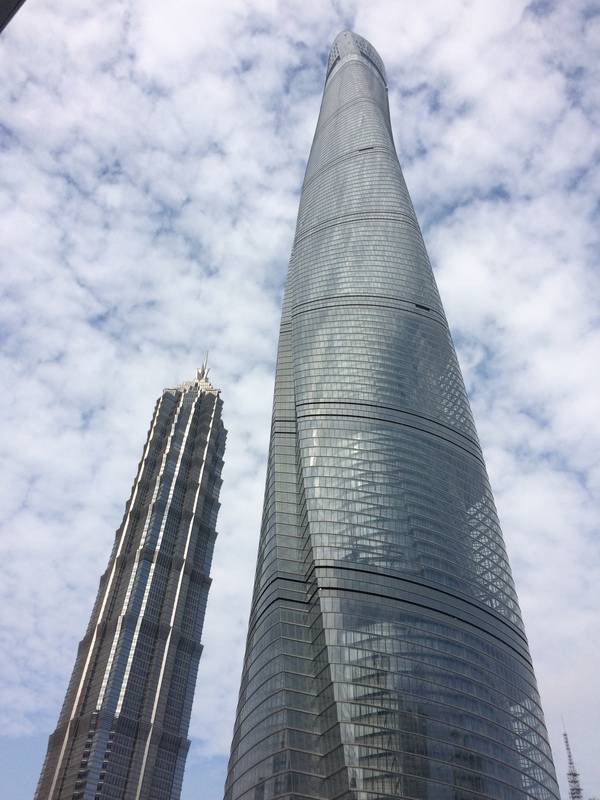 The Shanghai Tower has a brilliant logic to it, some of the other towers here not so much. One of the firms we visited today pointed out that a typical project here has a design team of about four, and a contract to turnkey time of about three years. So things move fast, and that doesn’t always make for rigorous thinking. At last year’s AIA Iowa convention, Marlon Blackwell described his criteria for judging design awards. Buildings, he said, had to be “resolute” at three scales–that of the city, that of the building, and that of the hand. That’s a pretty good recipe for design in general…with overtones of being not just determined, but purposeful, ‘resolute’ is a word I catch myself using all the time in studio nowadays. This came up, maybe inevitably, during our Seattle transect last week. 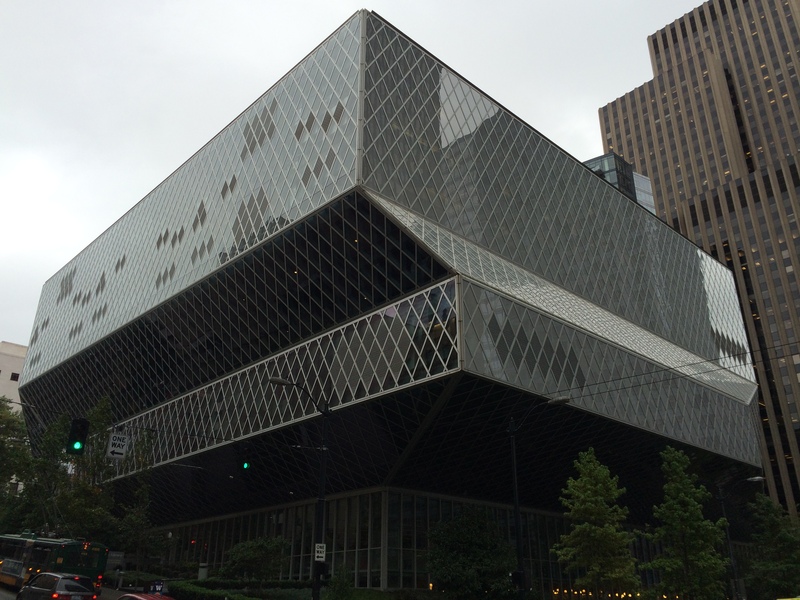 One day, as much of the city as we could walk, anchored by four well-known bits of recent architecture–which to me meant Olympic Sculpture Park, the Public Library, Seattle Art Museum, and St. Ignatius Chapel at Seattle University. The Library is a tough one for me to include on the list, because it goes against everything I try to emphasize in studio–its diagram is a purely programmatic and site response, and structure and circulation take a really obvious back seat to the overall massing. As a result the building was set up for hundreds of lousy details where structure tries to weave its way through OMA’s organizing concepts; the exterior “curtain wall” is forced to be a bearing wall, resulting in a steel diagrid that’s brilliantly conceived, but that has to twist, turn, and angle around all sorts of arbitrary geometry. 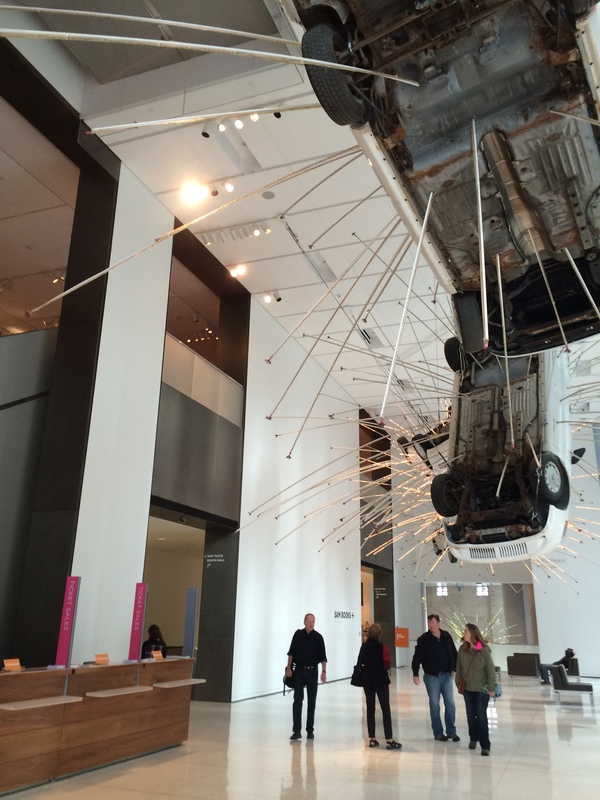 And yet…the public spaces inside are in fact pretty amazing, if you squint and don’t need to get anywhere in a hurry. And from the exterior it certainly has a presence, whether you agree with the outcome or not. 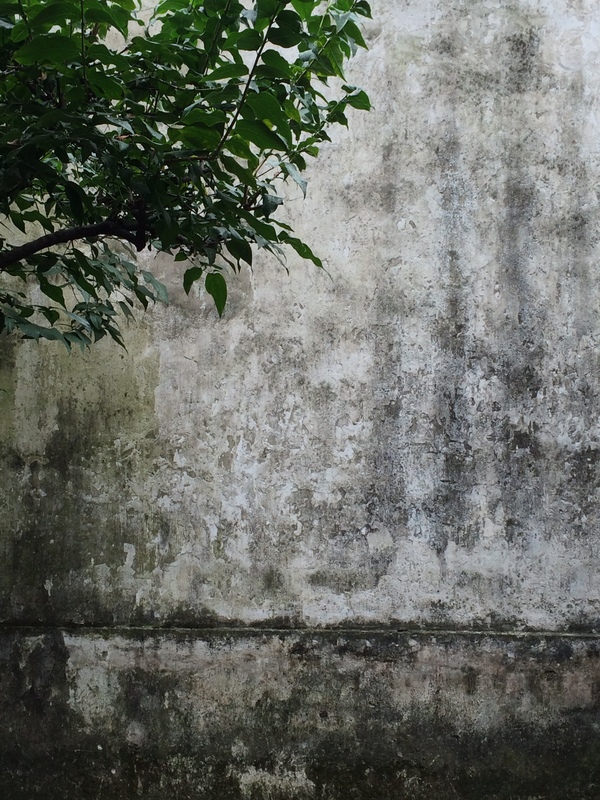 Purposeful and determined as an urban object? Sure. As a building? Not so much. The diagram is apparent, but it never gets resolved with all the other factors pushing against it. Allied Works’ Seattle Art Museum, on the other hand, is absolutely resolved at the level of the hand and as a building. We hung out in the lobby for a good half hour tracking details and grid lines, figuring out that there was a whole hierarchy of shadowgaps (the sign of a really thorough ordering effort), and pointing out just how clean a ceiling can be if you figure out absolutely everything that needs to go into it. I offered bonus grade points to anyone who could find something architectural that was out of place–we got one security camera and a single dodgy edge detail to a hung ceiling. OK, but resolved at the level of the city? Not so sure. A lot of Allied’s work is based on an empirical approach, where the building forms and spaces are the results of all the little decisions that get made correctly. It’s the opposite of the Seattle Public Library–here the diagram emerges out of understanding how all of the systems need to work together. I’m more sympathetic to this, no surprise, but I have to admit that the Museum’s presence on the street is probably less monumental than an art museum really wants to be. So, one that does both? The Olympic Sculpture Park ended up getting “best in show” from several of us, and that’s richly deserved. The diagram is a simple but really clever one–a switchback that negotiates between the level of the city a couple of blocks in from the water, and the shoreline itself, all while bridging a serious arterial road and a set of active rail lines (a trend in the visit this week…). That diagram gets resolved in a palette of materials and components–precast and in situ concrete, gravel and concrete, prairie and groomed grass, and metal and glass balustrades–that make the diagram legible even when you’re in the midst of it. 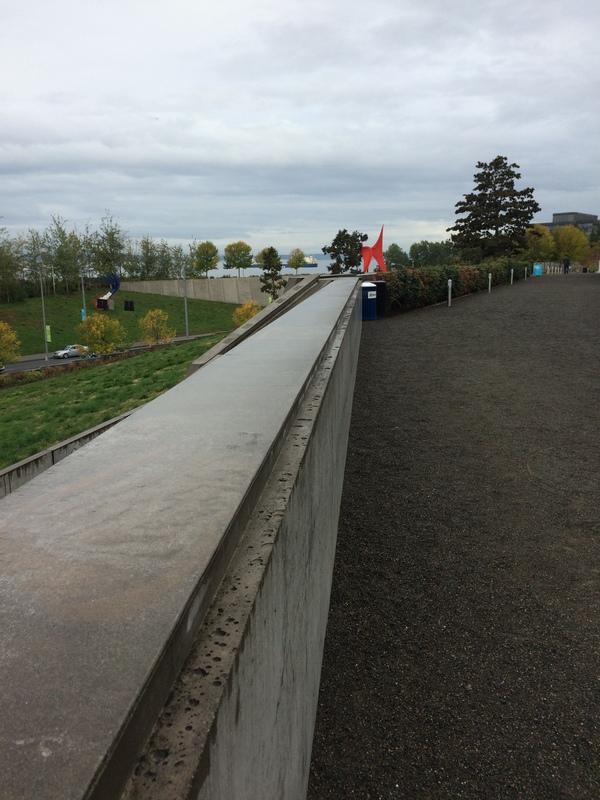 The fact that it contains a great collection of sculpture doesn’t hurt, but even if it was just a generous pedestrian path it reveals a lot about how the city really works, all while offering and framing views of the Sound and (if it’s clear) the Olympic mountains to the west. And, finally, as a palate cleanser? Steven Holl’s St. Ignatius Chapel at Seattle University, which violates all of these. 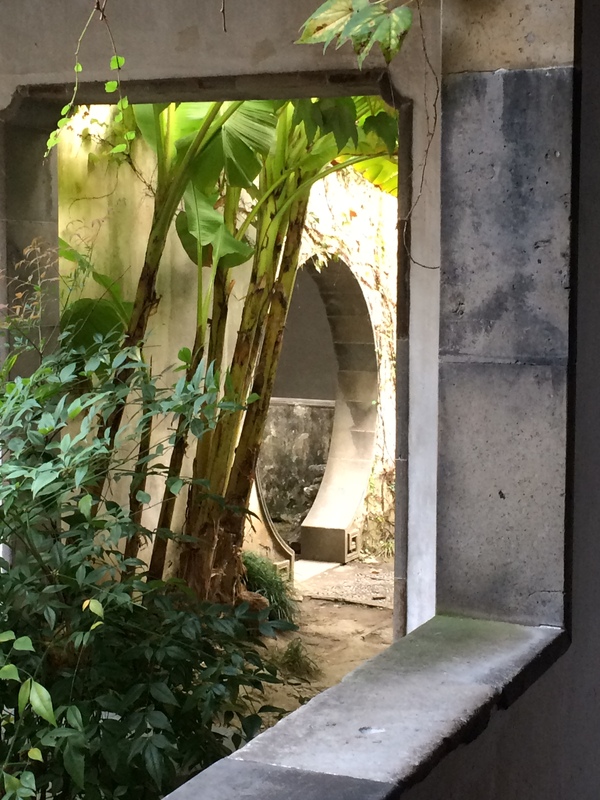 The space and the form it’s in are resolutely dissolute…nothing about them comes together in any sort of legible way. The sanctuary’s space wanders from light source to light source, with chapels more or less randomly placed around the perimeter…we shouldn’t like this one, right? 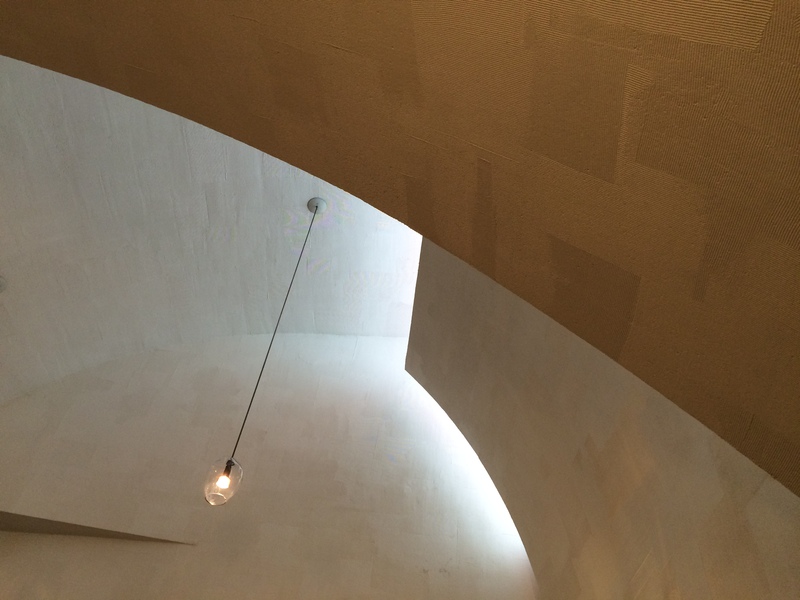 But…the Chapel’s space is so engaging, it has that perfect balance of incident and plainness that keeps the retinas occupied all the time. Holl’s trick of bringing in light by bouncing it off of (unbelieveably well-crafted) plaster surfaces, a few of them painted so that the ambient light takes on a carefully tuned color, is one of the most meditative spaces I’ve ever seen…Ronchamp on the Sound, for sure, but done in a way that feels more like an ongoing discussion than a tribute. Over drinks afterward we tossed around the idea that there’s a fourth realm of resolution…not so much how a building is resolved in its context, or in its construction, or in its detailing, but instead in our experience. 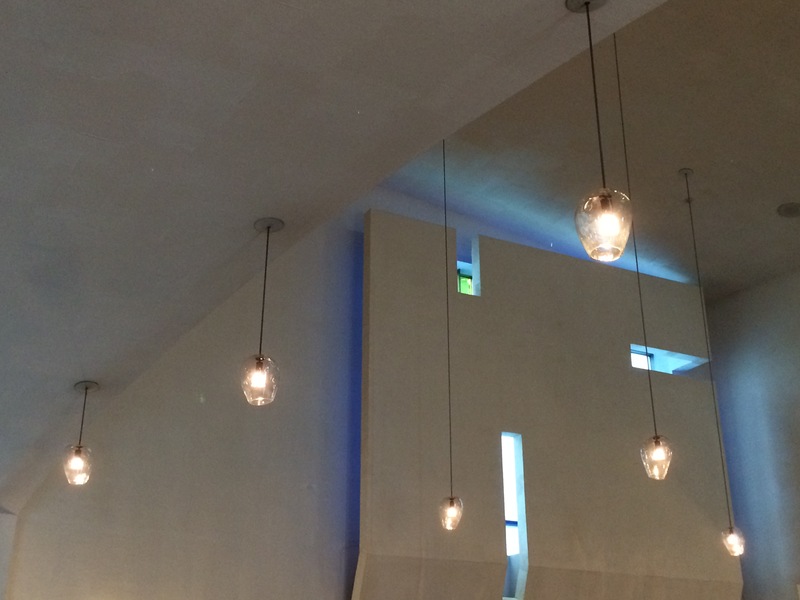 There are moments in the Chapel that feel like the architecture is just messing around with your cerebral cortex…and that’s not an unpleasant experience at all. Heading back to the midwest after a brief couple of days out west. Our ARCH 603/403 studio this year is focusing on high rise (me) and long span (the inimitable Rob Whitehead) and staging all of this in Seattle, for a change of pace. The high rise studio is proposing a mid-size convention hotel near the new(ish) sports facilities in SoDo–with a twist. 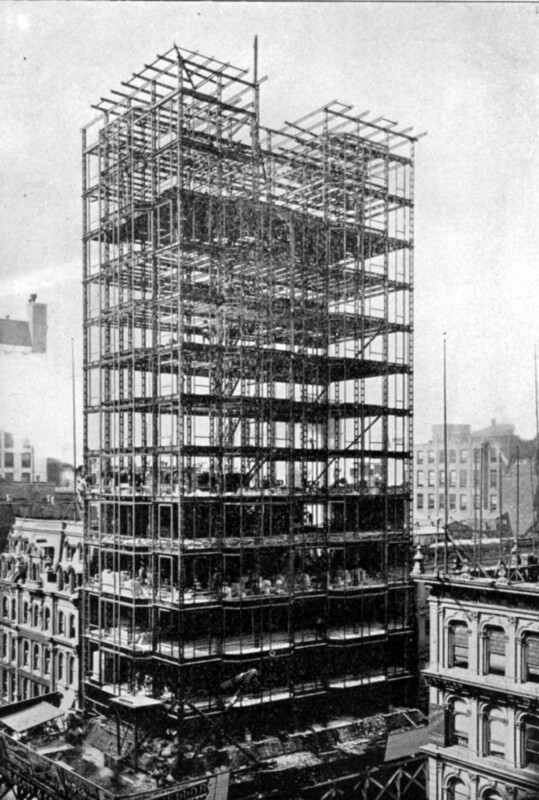 I’ve been interested in the challenge offered by so-called “air rights” skyscrapers since reading up on the original 1920s air rights towers in Chicago. Buildings like the Daily News, Merchandise Mart, and (later) the Prudential Tower were all built above active rail lines–the developers purchased or leased the rights to build tall from the railroads that owned the tracks. For the most part, the rails remained active during and after construction, so the buildings’ structures had to weave between tracks. This forced a regularity onto the structures above–or it meant giant, expensive, and space-chewing trusses to bridge over inconvenient tracks. In the past, we’ve used a parking garage to enforce structural regularity, but this seemed a far more interesting approach (and I’ve got serious moral objections to making parking a normal part of a building program…) Conveniently, King Street Station, Seattle’s main Amtrak stop, is located just north of the Seahawks’ stadium, and at the intersection of a couple of interesting neighborhoods–the tourist ghetto of Pioneer Square, the up and coming SoDo, and the character-full Chinatown and the International District to the west. The station was both a through station and a headhouse, so there’s a characteristic “L” shape to the leftover site–a challenge for a program that wants a large volume (banquet halls) and cellular space (rooms) above. We met up at the site on Wednesday and commenced figuring out the site history, which has involved the raising of the street grid around it and any number of generations of freight, passenger, and commuter lines being accommodated. In other words, a bit of a mess. That’s fine, though, since it means student teams are thinking about how to use the hotel to solve some difficult circulation problems. 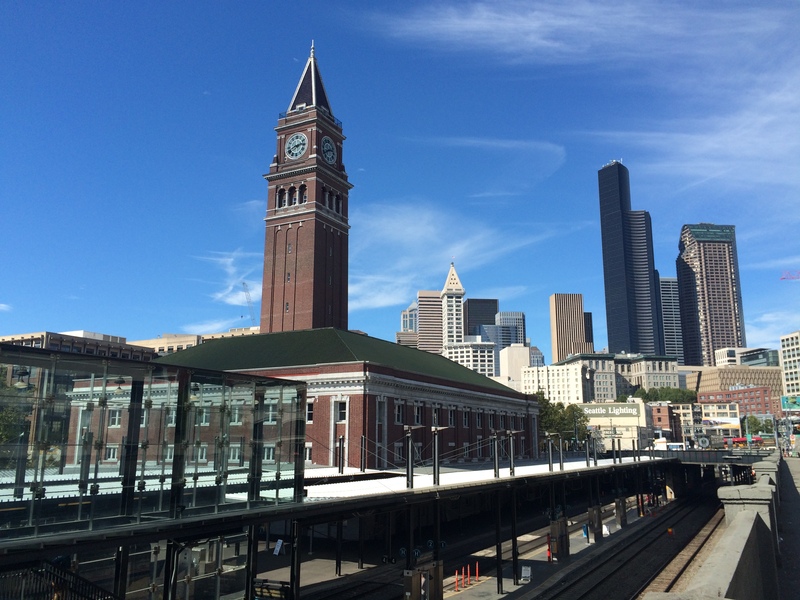 In addition to getting people from the street to the platforms, from the station to the platforms, and from the street to the station (no easy feat, since raising the street meant disconnecting the main hall from the city), there’s the need to get thousands of Seahawks fans across the site and down to the stadium. So the banquet halls are getting lifted up, the lobbies are becoming indoor/outdoor third spaces, etc., etc. Couldn’t have picked a better site…I’ll chalk it up to awesome intuition instead of just luck. You are currently viewing the archives for September, 2015 at architecturefarm.